Amp up your strength training routine with this Body Champ 5-position weight bench. Free weight workouts offer simple and effective ways to increase your strength and build your muscle mass. Pair up any of your existing compatible equipment -- from dumbbells to squat racks to cages -- with this Body Champ 5-position weight bench to enjoy sculpting, toning, and firming your entire body within compact space. Select from a variety of 5 available positions -- military (1), flat (1), incline (2), and decline (1) - and easily transition to any setting throughout your exercise sets with the "easy-glide" frame adjustment secured with a solid steel pull-pin. While you work to train and maximize your gains, this Body Champ 5-position weight bench is designed to maximize your form and comfort. The 4 foam rollers offer extended foam-density comfort. With over three decades in the fitness and wellness industry both in America and internationally, our knowledge in product design, manufacturing, and distribution provide us the tools to enhance the lives of many. We pride the health and well-being of our company on the health and well-being of your body. Our ultimate goal is to bring true benefits and wholesome results to the strength, stamina, and soundness of your health. We measure our success according to this purpose and strive to achieve it through: our research and product development, our quality inspections & product manufacturing process, our product performance, and our people. From our products' inception in design to their final delivery in your home, we are committed to providing quality and value that you can depend on. 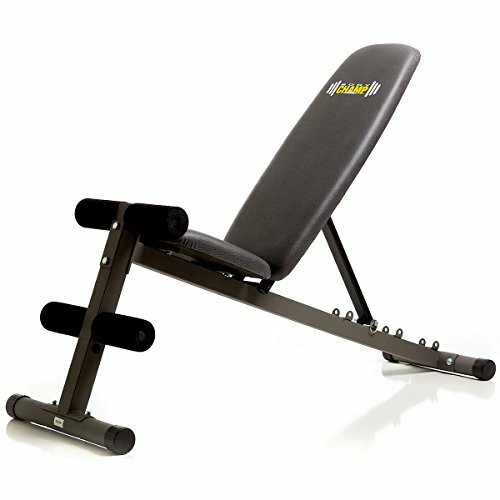 Reclines fully for core and oblique engagement with exercises such as leg lifts, Straight leg pendulums, etc.